Some more details, to follow up on our first encounter with monads in Monads shmonads and functional programming... we'll work on moving conceptually from function to functor. The functor is the first step in comprehending monads, for me - it lifts a simple function f : A => B into something higher level, F[A] => F[B]. Notice the difference… the second one, since it’s a member of a F[A] already, it will return the F[B] directly, bypassing the contraption (or so you'd think, until you realize that many collections are lazy... so in reality you are getting something that will eventually get you an F[B], as needed). Now instead of F think List or HashMap or Option… they’re all Functors (i.e. contraptions). 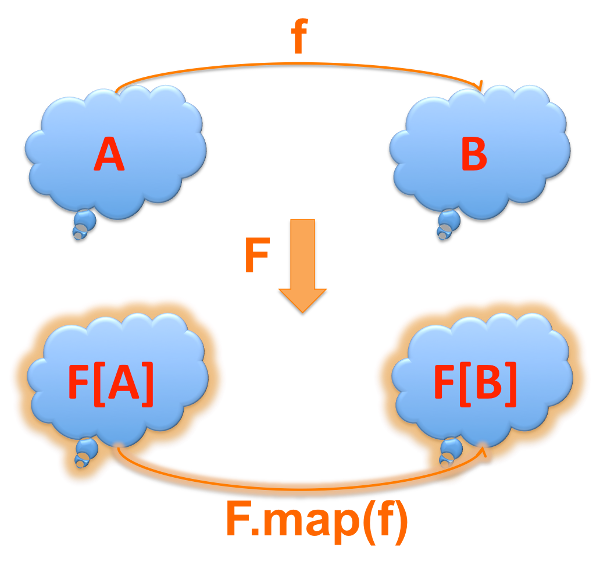 A => B => F[A] => F[B] which is traditionally called fmap() or in scala collections, replaced by a method form called map(). When using the method form, the role of unit is played by the type constructor, i.e. List(a) just took an a:A and made it a List[A]. This is why there's no method called unit on List. The first form is customary in languages that decouple the structures from their Functors, while the second is typical in OO languages. Now you're ready to read the more precise definition of a Functor in wikipedia. Let's drive it home with some actual examples. ... and that's where the Functors stop. I think this is a big step into the abstractions of category theory and making functional programming actually useful. We'll make the smaller step to monads soon. ... basically, a proper functor will obey this rule! This stuff is not relevant just for a sub-culture of "functional programming", but to the much larger sub-culture of "architecting it the wrong way". Too many times I see architectures and designs that add unnecessary complexity in component / framework / product design because the architects lack a basic understanding of functional composition principles. Functional programming is not only useful because we now have multiple cores and stateless web servers and reactive I/O libraries (and single-tasking node/JS) but also because it leads to a compositional architectural style that is completely uncluttered. A clean, functional approach to composition would help all the way to architecting product lines and assigning work to teams and resources more efficiently. Did someone in the gallery yell microservices? If that's your f though... where's your... F? Food for thought! Viewed 1266 times ( | Print ) this page.